Dean Austin has spoken of his pride at being appointed the new Cobblers boss - and has promised the supporters he wants to ‘develop a culture of excellence’ at Sixfields. The 48-year-old put pen to paper on a two-year deal on Saturday morning to become the club’s new manager after a five-match spell as caretaker boss following Jimmy Floyd Hasselbaink’s sacking last month, and he says he will be expecting ‘the highest of standards’ from his players. “I am very proud to have been appointed manager of Northampton Town,” said Austin, who was assistant to Hasselbaink. “The chairman, the board, the staff, the players and the supporters have had a glimpse at the way I want to work in the last few weeks and I have been delighted with the way everyone has responded. Austin, who took the helm with the team needing four wins from their final five games, may have been unable to stop the Cobblers suffering relegation from Sky Bet League One, but he did breathe life into their bid to do so. Wins over Bury and Plymouth meant Town went into the penultimate game of the season with their fate in their own hands, but a last-gasp 1-0 defeat at the Bescot saw them relegated. 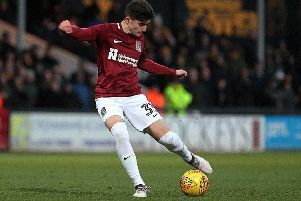 There had been a big improvement in the performance of the team though, and Austin has told the Cobblers fans they can expect more of the same as he really gets his feet under the manager’s table. “The supporters can expect us to play in an aggressive way and on the front foot,” said Austin. “We will not be afraid to be brave or to take chances but I also want us to be horrible to play against. “Our first priority is to try and get the club back to league one as soon as possible and to give the supporters some fun and entertainment along the way. During his caretaker stint, Austin was assisted by Jon Brady, but the Australian will not be taking up that position on a permanent basis. The former Brackley Town boss will continue in his role as the club’s Under-18s boss, but with Austin keen on promoting youth from within, he says Brady will still have a role to play in the first team set-up. “Jon has been a fantastic support,” said Austin, who was also helped out on match days by head of recruitment Andy Melville. “He is also doing a first class job helping to produce an exciting group of young players and he will revert back to that role to continue his excellent work albeit with additional first team responsibilities. “I am very excited by the crop of young players we have in the first team squad and coming through the academy, and it is important we work to develop that pathway further so that players from the under 9s upwards know the path is open for them.